Responsible Recruitment aligns ethical labour practices with achievement of commercial goals to benefit both workers and your business. A comprehensive review of relevant global social compliance standards and codes produces 27 responsible recruitment standards covering the sourcing and supply of workers – Please see below. Ethical labour standards and responsible sourcing activities have tended to focus on the place of work. There is a growing awareness that many of the causes of worker mistreatment and exploitation in global supply chains occur outside the workplace and before employment in the process of recruitment. Risk assessments identify new outsourced labour supply models; migrant and vulnerable workers in precarious temporary, agency and seasonal work as presenting the greatest human rights risks in supply chains. These risk assessments, together with new modern slavery, due diligence and transparency legislation, media focus, NGO and industry action are driving businesses to ensure workers in their supply chains are recruited ethically, professionally and responsibly. Read our Whitepaper to find out more. What is the Responsible Recruitment Toolkit? 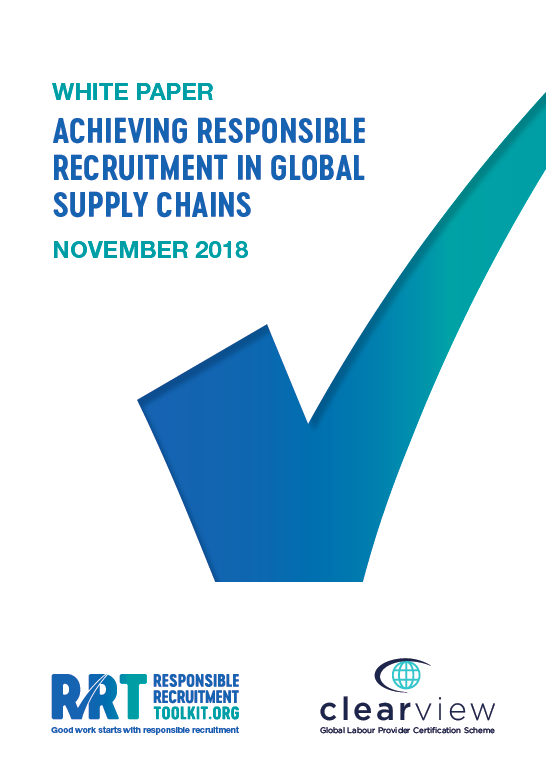 The Responsible Recruitment Toolkit (RRT) enables labour providers, employers and brands to raise the standard of recruitment in their business and global supply chains. RRT is a pioneering, interactive, one-stop online toolkit that provides comprehensive and practical step by step guidance, tools and resources to support your business to embed responsible recruitment practices. The RRT platform enables each business to self-assess, track and report, internally and externally to clients, their progress made in embedding ethical and responsible management systems and business practices. Subscribe now to access the full range of detailed practical steps, guidance, resources and progress reporting functions. Register now for free to access key template policies and summary guidance. Questions? Contact us to find out more. RRT is a joint initiative of the Association of Labour Providers and allianceHR with support from our sponsors. What are the benefits of using the Responsible Recruitment Toolkit? Key – IH: In-house recruitment/HR, LR: Labour Recruiter, LP: Labour Provider. *This standard applies to the supply/management of workers by a Labour Provider, rather than their direct employment.